The GVS Record Playback Download Archive solution (RPD)HD for GVS9000 VTR Product Family), allowing simple single point record, play and down sample of uncompressed HD content to a large number of file formats for instant distribution for the digital cinema, and long and short term archive. 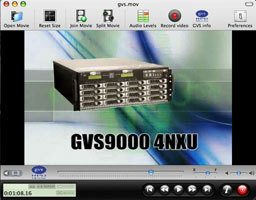 GVS-RPD Pro is a full-featured movie archival, management, viewer, and converter application for GVS9000 VTR's. It requires GVS9000 VTR. GVS-RPD Pro allows you to record, play and convert video and audio files of many different formats and perform track extraction and editing operations. By upgrading to GVS-RPD PRO you will be able to convert videos to many different formats, including QuickTime, Windows Media, MPEG-4, MPEG2, H.264, iPod, Apple TV, mobile phone (3G), iPhon, AVI and others. GVS-RPD Pro also allows you to perform additional activities such as stitch movies, display scene selection drawer, extract movie video/audio tracks to new files, split movie, join movie, record audio, record video, play dvd, play streaming video, edit videos, play forward and reverse with active audio, get complete information about the movies, reset size and format, instant audio recording 8 channel audio preview and many more. This is an important development for users who need immediate down sampling of projects for client review in real-time. With today’s challenges in production moving from traditional file base to full digital, from camera to editorial, GVS-RPD provides the essential glue for dailies to be proofed immediately after, or even during the recording process. The ability to instantly down sample content in different formats with a wide selection of specific scenes is a vital production tool. GVS-RPD Pro in the center of production in conjunction with the GVS9000 VTR's brings tools for users to maintain their complete workflow in uncompressed Quick-Time or DPX format. FinalCut Pro HD users now have the ultimate tools.